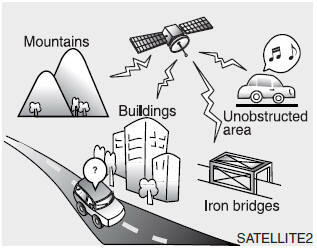 You may experience difficulties in receiving XM satellite™ radio signals in the following situations. If you are driving in a tunnel or a covered parking area. If you are driving beneath the top level of a multi-level freeway. If you are driving under a bridge. If you are driving next to a tall vehicle (such as a truck or a bus) that blocks the signal. 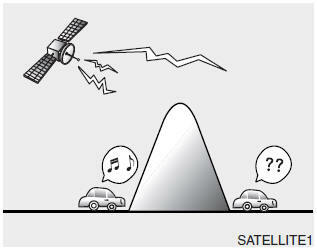 If you are driving in a valley where the surrounding hills or peaks block the signal from the satellite. If you are driving on a mountain road where is the signal blocked by mountains. If you are driving in an area with tall trees that block the signal (30 ft. /10m or more), for example on an road that goes through a dense forest. The signal can become weak in some areas that are not covered by the XM repeater network. There may also be additional unforeseen circumstances leading to reception problems with the XM satellite™ radio signal. Advisory Messages, such as ‘CH Unavailable’may occur when starting XM Radio™.